Oceanfront Beauty! 6 Bedrooms and 6 baths with central heat and air, washer/dryer, 2 dishwashers, 2 refrigerators, microwave and ice maker. Entertain the whole family with 7 televisions, 4 DVD players (includes 2 BluRay players), expanded cable service including Encore, phone with extended local calling in NC/SC. Prepare meals for your family in the beautiful kitchen, large dining area, with 2 refrigerators, 2 dishwashers, gas stove, and more. Ceiling fans, hardwood floors and ceramic tile and other upgrades throughout. 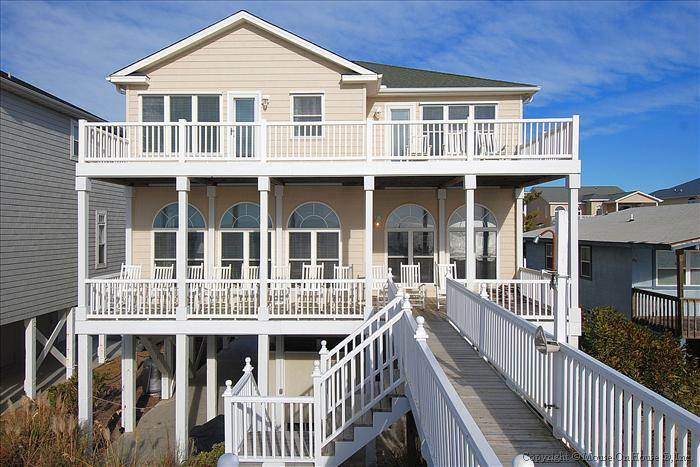 Large oceanfront deck with Weber charcoal grill and gas grill, outside shower and benches on the dunes. Port-a-crib, Highchair, Bedrail, Beach Umbrella and wireless internet access. New covered and extended deck 2017! This is a ***NON-SMOKING*** house.